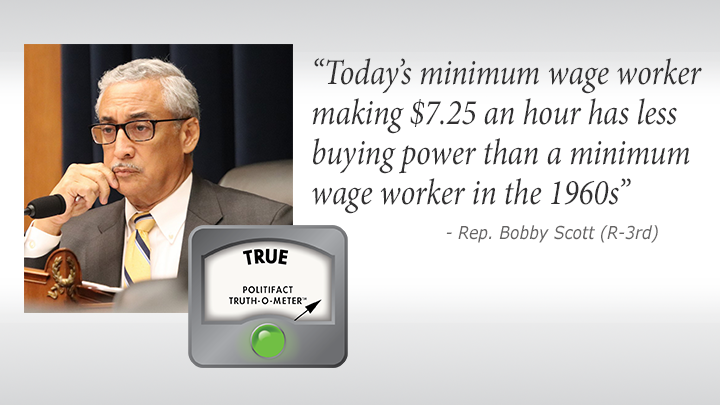 PolitiFact Virginia: Scott Statement on Buying Power Rings "True"
U.S. Rep. Bobby Scott, D-3rd, recently touted his bill to raise the federal minimum wage to $15 a hour before the House Education and Labor Committee. “Today’s minimum wage worker making $7.25 an hour has less buying power than a minimum wage worker in the 1960s,” he said during a Feb. 7 hearing. We wondered if Scott was correct, so we looked at the data. In 1961, the minimum wage was raised to $1.15 and sat there the following year. In today’s dollars, it was worth $9.63 in 1961 and 9.57 in 1962. In 1963, the wage rose $1.25 and stayed there for the next three years. In today’s dollars, it was worth $10.23 in 1963, $10.13 in 1964, $9.94 in 1965, and $9.69 in 1966. In 1967, the wage increased to $1.40. In today’s dollars, it was worth $10.56. In 1968, the wage rose to $1.60 and stayed there for six years. In today’s dollars, it was worth $11.58 - an all-time high - and $10.98 in 1969. When adjusted for inflation, the average federal minimum wage during the 1960s was $10.09 and hour - $2.84 higher than today’s wage. That’s a 28 percent decrease in value. Over a 40-hour work week, that translates to $113.60 in lost gross pay. Scott’s bill would gradually raise the minimum wage to $15 an hour in 2024, and afterwards index it to inflation. Scott and other supporters of the measure say it would put more money in pockets of an estimated 40 million workers, many of them women and minorities. They predict that the increased spending power will lift the economy. Opponents of the bill, including the U.S. Chamber of Commerce, say the $15 an hour wage would harm small businesses, especially those located in the areas with low costs of living. It should be noted that were at least three bills introduced in the General Assembly this winter to raise Virginia’s minimum wage, which is set at the federal floor of $7.25 an hour. All of the measures were killed in committees. Thirty states have raised their minimum wages above the federal floor. When adjusted into today’s dollars, the minimum wage of that decade varied from $8.57 an hour to $11.58. The average over the decade was $10.09 and hour - significantly higher than today’s rate. We rate Scott’s statement True. U.S. Rep. Bobby Scott, Statement to House Education and Labor Committee (12:22 mark), Feb. 7, 2019. PolitiFact, “ Is the minimum wage worth less now than 50 years ago? ” May 22, 2018. Library of Congress, H.R. 582, Jan. 16, 2019. Bureau of Labor Statistics, CPI Inflation Calculator, accessed Feb. 8, 2019. Federal Reserve Bank of St. Louis, Federal Minimum Hourly Wage for Nonfarm Workers in the United States, accessed Feb. 8, 2019. National Conference on State Legislatures, “2019 Minimum Wage by State,” Jan. 7, 2019. Legislative Information System, SB1017, HB1850, and HB2157.